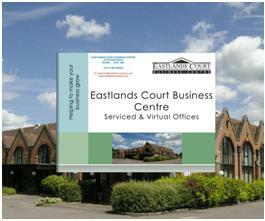 Why Choose Eastlands Court Serviced Offices? Add offices or move to larger offices as your business expands. We have a flexible approach with our clients. You need rent only the amount of space you may require in the short term. Opportunities will arise for you to acquire additional or alternative office space should you wish to expand. We look after your reception, answer the telephone (should this be required), greet visitors and take messages. We take the worry out of running an office, as well as the financial burden and commitment involved in leases, staff, capital equipment and furniture - so you can concentrate on the important things - running your business. We have a comfortable meeting room where you can meet your clients, together with on-site car parking. We are also ideally located for the railway station (London Inter-City one hour) and motorways. We have the latest telephone equipment with ISDN so that even when you are out of the office important calls can be put through, wherever you may be. Voice mail facilities are also available, together with fully secured Wireless Broadband, enabling you to gain access to your email and internet whether you are in your office or utilising the meeting room.